Recently I picked up some products from the Lush Valentine's Day range (click here if you missed it!). 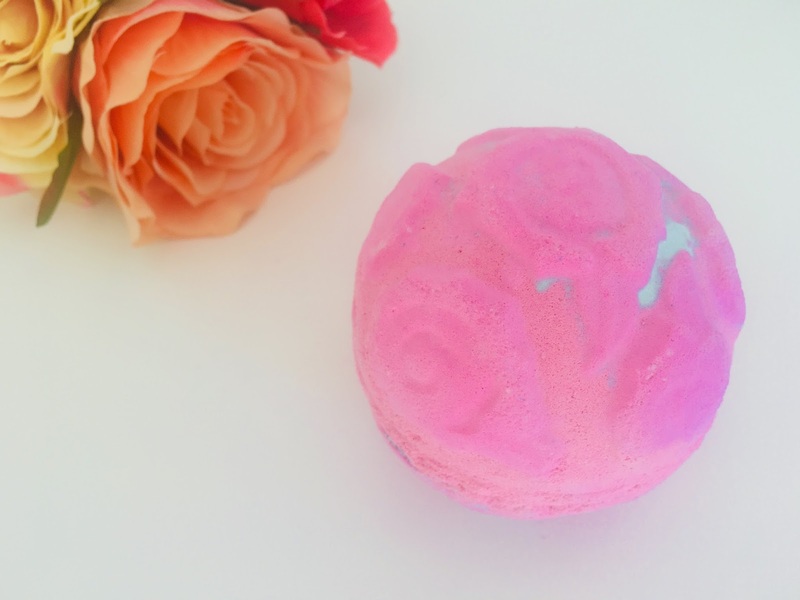 One of the products that caught my eye was the Rose Bombshell bath bomb. With it's pretty pink rosy exterior - I couldn't resist! Available in two sizes, the Rose Bombshell bath bomb comes in a regular size, and a giant size - just like the Golden Wonder bath bomb was at Christmas. I decided on the regular size for myself! I just love the rose petal detail on the top of the bath bomb itself - it's so pretty! The rose theme continues with the scent too, as the smell of the bath bomb is very floral and smells just like a fresh bouquet of roses. That being said, it's not overpowering in the slightest and I personally found it very fresh but also a smell that I'd love to have around the house! The ingredients included in the bath bomb are Rose Absolute, Rose Oil, and there's also a hint of citrus with some Sicilian Lemon Oil. When the bath bomb is placed in the water, the water instantly turns a beautiful pink colour while the bath bomb fizzes around the bath. What I didn't expect was a flurry of yellow rose petals to emerge from the bath bomb! Although it adds to the effect, I'm personally not a big fan of petals in the bath - it's not a criticism, but it's just not for me unfortunately! However, it wasn't a problem - I just picked them out of the tub! I found this to be a very relaxing bath bomb to use, because the scent was so subtle - I felt like I could easily unwind and nearly fell asleep whilst in the bath! I really hope that Lush releases this again for Valentine's Day next year too, because I really enjoyed this bath bomb - especially the scent. If you're interested in picking up the lovely Rose Bombshell bath bomb - it's on sale for a limited time only in Lush stores and online for £4.50.